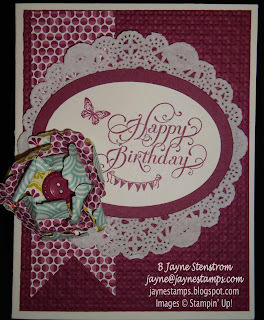 I am excited to announce some of my upcoming stamping classes. If you're in the southwestern Michigan area and would like to come to class, these are for you! If you're not in the area, but would like to participate, I can mail you all the materials for each class with written instructions. The only extra thing you would need to provide is your own stamps and ink. I am not allowed to stamp the images and send them per Stampin' Up! rules. Come to class and make a whole stack of cards in one night! We will make 10 cards with envelopes - 2 each of 5 different card designs that you can personalize for whatever you need. Cost for this class is $20. Please RSVP no later than Sunday, April 28. Your payment guarantees your spot in class. Make an adorable two-sided banner to add to your Spring/Summer Decor using papers from the Print Poetry Designer Series Paper Stack! If you're coming to class and would like a sneak peek at what the banner looks like, just send me an e-mail and I'll send a picture. The banner looks adorable hanging pretty much anyplace. This project would also make a great gift. (Mother's Day anyone?) Class fee is $25 and includes all supplies to make both sides of the banner. Price for class includes a full package of the Print Poetry DSP Stack (pg. 16 in the Spring Catalog). You will have extra sheets of the designer series paper to take home with you - and this paper is adorable! Space is limited to the first eight who RSVP with their payment for class. You must RSVP by May 3 so that I have time to order the extra supplies for this class. For all classes, please bring your own adhesive, scissors, and paper trimmer. All other supplies provided unless noted otherwise. I'm looking forward to stamping with you again soon! And here's a quick card sample to keep you inspired. 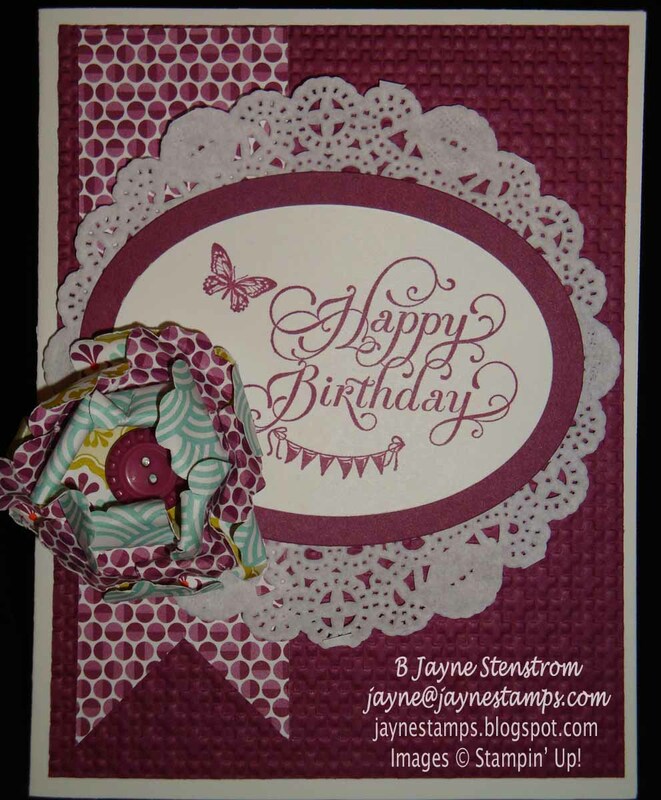 ACCESSORIES: Ovals Collection Framelits Dies, Tea Lace Paper Doilies, Blossom Punch, Square Lattice TIEF, and Sycamore Street DSP and Buttons (Sale-a-bration items currently retired, but you can use any designer series papers you like).